Have you ever noticed that sometimes you pour your heart and soul into something and it goes virtually unnoticed? That’s what happened with my How To Make a Perfect Bow post. Here’s the scoop…I fell in love with a grain sack bow that was featured on the blog Dreamy Whites. So I made my own and used it on my front door wreath. I decided, just for the heck of it, to post a tutorial on how to make this 3 piece bow. I pinned it to my How To board on Pinterest…and I might have (accidentally) pinned it to a few other boards too. Then, Centsational Girl hosted a Christmas Craft Linky Party. I managed to link up in the number 8 position. Unbelievable for me since I am notoriously late for most linky parties. A few days later I checked the pin count on my Perfect Bow post and it was almost 4,000. As of today the pin count is over 9,600. Can you even believe it? One more thing…I mentioned the other day about my trials and tribulations when I installed Google Analytics. Everything was working fine by the time I published the Perfect Bow post. According to Google Analytics, that post has over 18,000 page views. So…sometimes, when you least expect it, good things happen. After a year of ups and downs, my little blog can close the book on 2012 with it’s head held high. We went viral on Pinterest. Can’t ask for much more than that. Ann, thanks so much for your New Years wishes. I’ve just been catching up on my blog reading and enjoyed your overview of your year. The bow you made is fantastic so I can see why it went viral. I have to agree that 9,000 pins is amazing. And, it couldn’t have happened to a more talented lady. May this New Year bring you many more successes! That’s awesome, Ann. You are so right. I have a thrown together, “hey, look what I made” post that I thought nothing of. It, too, is my most viewed post! It’s funny how that happens. I’ve learned it’s the things you never expected to be popular are the exact things that take off. Seems I’m always wishing I’d taken better pictures of those things. Your bow and wreath are very pretty, so it’s easy to see why people are so interested. Congrats on the success of your blog! Happy New Year, Ann! Hi Ann! Congratulations! I was just thinking about you today and thought I’d pop over. 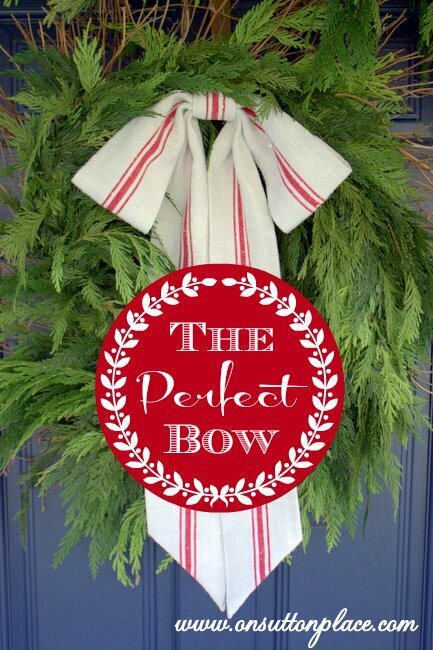 I can see why this one went viral since many of us are bow making challenged (at least I am). It’s wonderful when your post goes virtually viral! It’s a wonder anyone ever reads anything that I write or post, but I keep doing it for the fun and love of it. Now I’m heading on over to check out your pin. I’d say that is quite a way to end the year! Cheers to all the success in 2013! Love your grainsack bow as well . You make the loveliest things, so I’m not surprised you got so many responses. Thanks for leaving a comment on my blog and have a Happy New Year! Ann, this is such exciting news! And what a way to end the year! I bet you are smiling from ear to ear! Happy New Year-I think more exciting things are in store for you! That’s wonderful, Ann! I agree with everyone else – it’s easy to see why this particular project went viral. Happy New Year! You are so right Anne! There is no way to know what will go crazy. I can see why this did though :) You can hold your head high for certain. Even with out that mega pin ;) You create beautiful, beautiful things. It’s like the old saying, “build a better mousetrap…” and it couldn’t happen to a nicer blog! Wow, that’s a crazy awesome pin count! I loved that bow tutorial, too, and it’s definitely pin-worthy! Life is just illogical sometimes. Glad for you, though – you deserve it, Ann. It is a great post Ann. I have a feeling about some of what is behind it all. Exciting to see it all connect across the ‘sphere’ like that! Well how about that?! That’s wonderful! You just never know. I have noticed that myself that sometimes what you find ordinary, others find extrordinary! Your bow tutorial came at just the right time for the holidays. I’m sure that helped it’s numbers too. I love how that bow looks and so glad that you shared that tutorial. Wow, way to go with the perfect bow! That’s so true,the things you never expect become hits. Congrats on those great numbers Ann, you always post the most beautiful work. That is amazing. Great work! It really was a great tutorial and the fact that yours came out so beautiful didn’t hurt either! Love it! That’s great Ann, congratulations! It is a pretty photo, well done!